It is best to work out an hour after breaking fast with a light meal or an hour before morning meal. Should one workout when on fast during Ramzan? If you’re a diabetic, can you fast? Health experts say both workout and diabetics fasting are possible with some careful considerations. Sports medicine professionals say that workout should be done with extreme caution with an eye on hydration levels. “Regulars at gyms should also start slowly before they increase intensity and keep cardio to a minimum. Ideally, they should work out at lower intensity and volume than days when they do not fast. For those who are not used to regular workout, it is best avoid starting while on fast,” said Sharat Kumar, Sport Medicine Consultant at Apollo Hospitals. He added that it is best to work out an hour after breaking fast with a light meal or an hour before the morning meal, which incidentally is the most common practise in gyms of the city. Fasting during Ramzan is one of pillars of Islamic faith, required of every Muslim if health permits it. While many with conditions like diabetes, often forego fasting, doctors say a consultation with the physician can often reveal a sugar management that can help a diabetic also endure a fast. However, complications like renal and heart problems can make management of the condition difficult, thus often warranting advice against fasting. “The key is to prevent hypoglycaemia or low blood sugar levels during fasting period. While any advice cannot be applied to all diabetics, fasting is possible if a diabetic’s sugar levels are well-managed before the onset of a fast,” said Srirang Abkari, an Internal Medicine Consultant at Global Hospitals. Dr. Abkari adds that fasting is generally discouraged for type 1 diabetics but type-2 diabetics managing their blood sugar levels with just food, medication or some insulin can undertake fast. He also suggested consumption of complex carbohydrate foods in lieu of foods rich in sugars. Similar thoughts were echoed by Rakesh Kumar Sahay of Osmania Medical College in a journal published earlier this year. 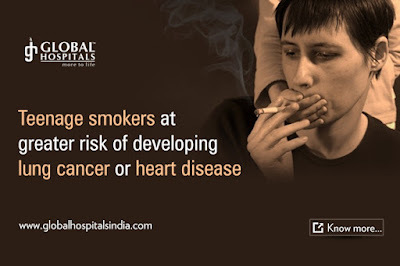 Mumbai: May 31, 2016: Younger the age at which people start smoking, greater the certainty that they will end up with one of several life threatening diseases. Early smoking is associated with subsequent heavier smoking, higher levels of dependency, a lower chance of quitting, and an overall higher rate of mortality. Adolescent smoking causes serious risks to respiratory health, both in the short and long term. Youngsters who smoke are two to six times more susceptible to cough and increased phlegm, wheezing and shortness of breath than those who do not. Moreover, smoking impairs lung growth and initiates premature lung function decline which may lead to an increased risk of chronic obstructive lung disease later in life. Many teenagers and adults underestimate the effects of smoking, and do not believe it will have any effect on their bodies until they reach middle age. Smoking-caused lung cancer, other cancers, heart disease, and stroke typically do not occur until years after a person's first cigarette. The truth, however, is that smoking has numerous immediate health effects on the brain and on the respiratory, cardiovascular, gastrointestinal, immune and metabolic system. While these immediate effects do not all produce noticeable symptoms, most begin to damage the body with the first cigarette itself – sometimes irreversibly – and rapidly go on to produce serious medical conditions and health consequences. Children are also more susceptible to the effects of passive smoking. Parental smoking is the main determinant of exposure in non-smoking children. Bronchitis, pneumonia, asthma and sudden infant death syndrome (cot death) are significantly more common in infants and children who have one or two smoking parents. Parental smoking has also shown to increase a child’s risk of resorting to smoking. Every day 80,000 to 100,000 young people around the world become addicted to tobacco. Secondhand smoke kills more than 600,000 people worldwide each year, including 165,000 children. If current trends are to continue, 250 million children and young people will die from tobacco-related diseases. This World No Tobacco Day calls for urgent attention to the widespread prevalence of tobacco use and to its negative health effects. Quit today to prevent a host of medical conditions at a later stage in life.